Being a Hawk is something I take a lot of pride in. When I was in the thick of my college search as a high school senior I knew that I wanted to be at a school near a city, a school that had Division I athletics, and a school that had a sports marketing program. These factors helped me refine my search for a school immensely, but there were some non-tangible aspects that led me to enroll at Saint Joseph’s University as well. When you’re looking for a college people will tell you that you’ll “have that gut feeling” when you visit the school for you: the one where you ultimately enroll. When I took my first visit to St. Joe’s I had that feeling immediately, like the moment when you first fall in love with someone. For anyone who’s walked the campus of St. Joe’s, there’s an undeniable “buzz” that encapsulates the University. We hold doors for one another, we smile as we pass on campus, and we admire the natural beauty of Barbelin Tower. There’s just something different about Saint Joseph’s, and I felt it as soon as I stepped on campus. “The Hawk” to me is the intangible spirit that resides in each person who has and will grace the campus of Saint Joe’s. However, being The Hawk mascot and being the individual who brings this spirit to life has been one of the greatest honors I have ever had. Going into college, being a mascot was not something that was on my radar. 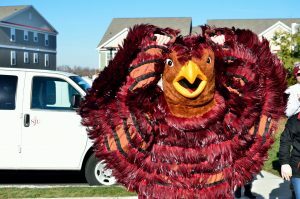 However, while managing for the men’s basketball team my freshman year, I befriended the current Hawk at the time and made my first public appearance as the mascot in the spring of my freshman year. To make a long story short, this began a long, winding journey to this year, where I was chosen as the 39thHawk mascot in school history. On gamedays for basketball, and in any public appearance I make as The Hawk, my goal has always been the same: to represent the people and the unwavering spirit of Saint Joseph’s as best I can. The constant flapping of my wings in a way represents the motto of the University: that no matter what happens, The Hawk Will Never Die. There are many traditions in college basketball, and maybe I’m biased, but I believe The Hawk mascot is the best tradition in the sport and is just one of the countless reasons why Saint Joseph’s University is such a special place. Choosing to #BeAHawk has been one of the best decisions I have ever made in my life and being The Hawk has been a profound honor that I often struggle to put into words. In a way, being the University’s mascot is representing the “non-tangible spirit” that surrounds the University and its people; it’s what distinguishes Saint Joseph’s from other Universities. If you choose to #BeAHawk, you’ll feel that spirit the minute you set foot on campus as a Saint Joseph’s student. While my time as a student here is drawing to a close, I and every other SJU alum will carry the spirit of The Hawk with me for the rest of my life. 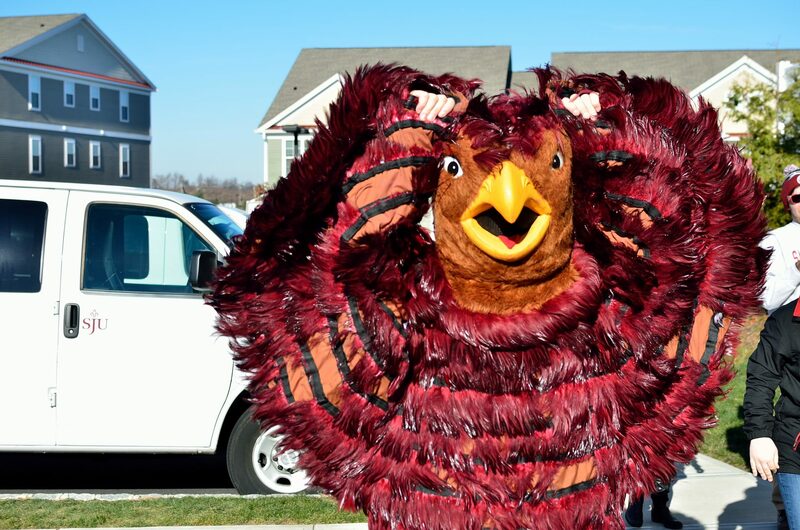 Which is why The Hawk Will Never Die and why the tradition of The Hawk mascot must be carried on long after I am finished flapping my wings; it is an incredibly important symbol of the University and represents the special individuals who have set foot on Hawk Hill.